There is a dispute about who actually made the first hamburger and bun in America. Have you ever wondered where the first hamburger on a bun came from? Which story you believe depends on your definition of a hamburger. Is it a hamburger when served on a bun? Or is it a hamburger when served between two slices of bread? Tracing history back thousands of years, we learn that even the ancient Egyptians ate ground meat, and down through the ages we also find that ground meat has been shaped into patties and eaten all over the world under many different name. 1209 – 1121 – Genghis Khan (1167-1227), crowned the “emperor of all emperors,” and his army of fierce Mongol horsemen, known as the “Golden Horde,” conquered two thirds of the then known world. The Mongols were a fast-moving, cavalry-based army that rode small sturdy ponies. They stayed in their saddles for long period of time, sometimes days without ever dismounting. They had little opportunity to stop and build a fire for their meal. The entire village would follow behind the army on great wheeled carts they called “yurts,” leading huge herds of sheep, goats, oxen, and horses. As the army needed food that could be carried on their mounts and eaten easily with one hand while they rode, ground meat was the perfect choice. They would use scrapings of lamb or mutton which were formed into flat patties. They softened the meat by placing them under the saddles of their horses while riding into battle. When it was time to eat, the meat would be eaten raw, having been tenderized by the saddle and the back of the horse. 1238 – When Genghis Khan’s grandson, Khubilai Khan (1215-1294), invaded Moscow, they naturally brought their unique dietary ground meat with them. The Russians adopted it into their own cuisine with the name “Steak Tartare,” (Tartars being their name for the Mongols). Over many years, Russian chefs adapted and developed this dish and refining it with chopped onions and raw eggs. Beginning in the fifteenth century, minced beef was a valued delicacy throughout Europe. Hashed beef was made into sausage in several different regions of Europe. Immigrants to the United States from German-speaking countries brought with them some of their favorite foods. One of them was Hamburg Steak. The Germans simply flavored shredded low-grade beef with regional spices, and both cooked and raw it became a standard meal among the poorer classes. In the seaport town of Hamburg, it acquired the name Hamburg steak. Today, this hamburger patty is no longer called Hamburg Steak in Germany but rather “Frikadelle,” “Frikandelle” or “Bulette,” orginally Italian and French words. The originated on the German Hamburg-Amerika line boats, which brought emigrants to America in the 1850s. There was at that time a famous Hamburg beef which was salted and sometimes slightly smoked, and therefore ideal for keeping on a long sea voyage. As it was hard, it was minced and sometimes stretched with soaked breadcrumbs and chopped onion. It was popular with the Jewish emigrants, who continued to make Hamburg steaks, as the patties were then called, with fresh meat when they settled in the U.S. The origin of the hamburger is not very clear, but the prevailing version is that at the end of 1800′ s, European emigrants reached America on the ships of the Hamburg Lines and were served meat patties quickly cooked on the grill and placed between two pieces of bread. E. Wade received Patent Number x5348 on January 26, 1829 for what may be the first patented “Meat Cutter.” The patent shows choppers moving up and down onto a rotating block. G. A. Coffman of Virginia received Patent Number 3935 on February 28, 1845 for an “Improvement in Machines for Cutting Sausage-Meat” using a spiral feeder and rotating knives something like a modern food grinder. Others have written the first hamburger – specifically hamburger steak – was served in 1834 at Delmonico’s Restaurant, New York City, for $.10. However, this oft-quoted origin is not based on the original Delmonico menu but rather a facsimile, and it can be demonstrated through careful scholarship that the published facsimile could not be correct, because the printer of the purported original menu was not in business in 1834! From 1871-1884, “Hamburg Beefsteak” was on the “Breakfast and Supper Menu” of the Clipper Restaurant at 311/313 Pacific Street in San Fernando. It cost 10 cents—the same price as mutton chops, pig’s feet in batter, and stewed veal. It was not, however, on the dinner menu; “Pig’s Head” “Calf Tongue” and “Stewed Kidneys” were. 1758 – By the mid-18th century, German immigrants also begin arriving in England. One recipe, titled “Hamburgh Sausage,” appeared in Hannah Glasse’s 1758 English cookbook called The Art of Cookery Made Plain and Easy. It consisted of chopped beef, suet, and spices. The author recommended that this sausage be served with toasted bread. Hannah Glasse’s cookbook was also very popular in Colonial America, although it was not published in the United States until 1805. This American edition also contained the “Hamburgh Sausage” recipe with slight revisions. Broiled Meat Cakes – Chop lean, raw beef quite fine. Season with salt, pepper, and a little chopped onion, or onion juice. Make it into small flat cakes, and broil on a well-greased gridiron or on a hot frying pan. Serve very hot with butter or Maitre de’ Hotel sauce. Hamburgh Steak – Pound a slice of round steak enough to break the fibre. Fry two or three onions, minced fine, in butter until slightly browned. Spread the onions over the meat, fold the ends of the meat together, and pound again, to keep the onions in the middle. Broil two or three minutes. Spread with butter, salt, and pepper. 1906 – Upton Sinclair (1878-1968), American novelist, wrote in his book called The Jungle, which told of the horrors of Chicago meat packing plants. This book caused much distrust in the United States regarding chopped meat. Sinclair was surprised that the public missed the main point of his impressionistic fiction and took it to be an indictment of unhygienic conditions of the meat packing industry. This caused people to not trust chopped meat for several years. Only one of the claimants below served their hamburgers on a bun – Oscar Weber Bilby in 1891. The rest served them as sandwiches between two slices of bread. Hamburgers, hamburgers, hamburgers hot; onions in the middle, pickle on top. Makes your lips go flippity flop. Resolved by the assembly, the senate concurring, That the members of the Wisconsin legislature declare Seymour, Wisconsin, the Original Home of the Hamburger. 1885 – The family of Frank and Charles Menches from Akron, Ohio, claim the brothers invented the hamburger while traveling in a 100-man traveling concession circuit at events (fairs, race meetings, and farmers’ picnics) in the Midwest in the early 1880s. During a stop at the Erie County Fair in Hamburg, New York, the brothers ran out of pork for their hot sausage patty sandwiches. Because this happened on a particularly hot day, the local butchers stop slaughtering pigs. The butcher suggested that they substitute beef for the pork. The brothers ground up the beef, mixed it with some brown sugar, coffee, and other spices and served it as a sandwich between two pieces of bread. They called this sandwich the “hamburger” after Hamburg, New York where the fair was being held. According to family legend, Frank didn’t really know what to call it, so he looked up and saw the banner for the Hamburg fair and said, “This is the hamburger.” In Frank’s 1951 obituary in The Los Angeles Times, he is acknowledged him as the ”inventor” of the hamburger. In 1991, Menches and his siblings stumbled across the original recipe among some old papers their great-grandmother left behind. After selling their burgers at county fairs for a few years, the family opened up the Menches Bros. Restaurant in Akron, Ohio. The Menches family is still in the restaurant business and still serving hamburgers in Ohio. On May 28, 2005, the town of Akron, Ohio hosted the First Annual National Hamburger Festival to celebrate the 120th Anniversary of the invention of the hamburger. The festival will be dedicated to Frank and Charles Menches. That is how sure the city of Akron is on the Menches’ family claim on the contested contention that two residents invented the hamburger. The Ohio legislature is also considering making hamburgers the state food. 1891 – The family of Oscar Weber Bilby claim the first-known hamburger on a bun was served on Grandpa Oscar’s farm just west of Tulsa, Oklahoma in 1891. The family says that Grandpa Oscar was the first to add the bun, but they concede that hamburger sandwiches made with bread may predate Grandpa Oscar’s famous hamburger. My great-grandfather, Oscar Weber Bilby invented the hamburger on July 4, 1891. He served ground beef patties that were seared to perfection on a open flame from a hand-made grill. My great-grandmother Fanny made her own home-made yeast hamburger buns to put around the ground beef patties. They served this new sandwich along with their tasty home-made rood beer which was also carbonated with yeast. People would come for all over the county on July 4th each year to consume and enjoy these treats. To this day we still cook our hamburger on grandpa’s grill, which is now fired by natural gas. Now Therefore, I, Frank Keating, Governor of the State of Oklahoma, do hereby proclaim April 12, 1995, as THE REAL BIRTHPLACE OF THE HAMBURGER IN TULSA DAY. 1900 – Louis Lassen of New Haven, Connecticut is also recorded as serving the first “burger” at his New Haven luncheonette called Louis’ Lunch Wagon. Louis ran a small lunch wagon selling steak sandwiches to local factory workers. A frugal business man, he did not like to waste the excess beef from his daily lunch rush. It is said that he ground up some scraps of beef and served it as a sandwich, the sandwich was sold between pieces of toasted bread, to a customer who was in a hurry and wanted to eat on the run. In the mid-1960s, the New Haven Preservation Trust placed a plaque on the building where Louis’ Lunch is located proclaiming Louis’ Lunch to be the first place the hamburger was sold. Louis’ Lunch is still selling their hamburgers from a small brick building in New Haven. The sandwich is grilled vertically in antique gas grills and served between pieces of toast rather than a bun, and refuse to provide mustard or ketchup.
. . . it is with great pleasure that I rise today to celebrate the 105th anniversary of a true New Haven landmark: Louis’ Lunch. Recently the Lassen family celebrated this landmark as well as the 100th anniversary of their claim to fame — the invention and commercial serving of one of America’s favorites, the hamburger . . . The Lassens and the community of New Haven shared unparalleled excitement when the Library of Congress named Louis’ Lunch a “Connecticut Legacy” — nothing could be more true. The hamburger business all started about 1901 or 1902 (The Grays aren’t sure which) when Mr. Gray operated a little cafe on the east side of Clarinda’s Courthouse Square. “He almost ran the other cafes out of the sandwich business,” Mrs. Gray put in. “He could make hamburgers so nice and soft and juicy – better than I ever could,” she added. One time the Grays heard a conflicting claim by a man (somewhere in the northern part of the state) that he was the hamburger’s inventor. “I didn’t pay any attention to him,” Mr. Gray snorted. “I’ve got plenty of proof mine was the first,” he said. 1904 – The hamburger gets its first widespread attention at the 1904 World’s Fair in St. Louis, Missouri, also known as the Louisiana Purchase Exhibition, where it created a sensation. A reporter for the New York Tribune wrote from the 1904 St. Louis World’s Fair of a new sandwich called a hamburger, “the innovation of a food vendor on the pike.” By “Pike” he meant the World’s Fair midway. Most Texans believe the vendor in question was Fletch Davis (1864-1941), also known as “old Dave” who owned a lunch counter in Athens, Texas. Supposedly Fletch Davis, at his Athens lunch counter, took some raw hamburger steak and placed it on his flat grill and fried it until it was a crisp brown on both sides. Then he placed the browned patty of meat between two thick slices of homemade toast and added a thick slice of raw onion to the top. He offered it as a special to his patrons to see if they would like it. In 1904 Davis and his wife went to the St. Louis World’s Fair either on his own or the townspeople took up a collection to send him (there is no evidence for that claim, however). Whoever paid for the trip, he was there since a reporter for the New York Tribune wrote from the fair of a new sandwich called a hamburger, “the innovation of a food vendor on the pike.” The reporter did not name the vendor but Athens resident Clint Murchison said that his grandfather had strong memories of the sandwich in the 1880s but remembered the innovator only as “Old Dave.” Murchison also had a large photograph of the midway at the 1904 fair with “Old Dave’s Hamburger Stand” marked apparently by his grandfather. When Davis returned from the fair there were already several cafes in Athens serving the sandwich and he went back to firing pots in the Miller pottery works. Tolbert’s investigation proved that “Old Dave” was Fletcher Davis from Athens (Tolbert 1983). In 1984, a plaque was placed on the Ginger Murchison Building, approximately on Fletch Davis’ cafe site. In 2006, a bill was introduced into the Texas Legislature, H.C.R. No. 15 – CONCURRENT RESOLUTION, to make Athens, Texas “Original Home of the Hamburger.” This bill is based on the research of Frank X. Tolbert into Fletcher Davis only. 1916 – Walter Anderson from Wichita, Kansas, a fry cook, developed buns to accommodate the hamburger patties. The dough he selected was heavier than ordinary bread dough, and he formed it into small, square shapes that were just big enough for one of his hamburgers. He quit his job as a cook and used his life savings to purchase an old trolley car and developed it into a diner featuring his hamburgers. In 1921, Anderson co-founded the White Castle Hamburger with Edgar Waldo “Billy” Ingram, an insurance executive, in Wichita, Kansas. It is the oldest hamburger chain. They serve steam-fried hamburgers, 18 per pound of fresh ground beef, cooked on a bed of chopped onions, for a nickel. The popularity the character Wimpy spawned a successful chain of hamburger restaurants called Wimpy’s, that flourished for over a decade. This burger went for the upscale market at 10 cents a burger. In keeping with the founder’s wishes, all 1,500 restaurants were closed down when he died in 1978. A ‘hot dog’ or hamburger sandwich is the type of food frequently offered for sale to and desired by persons who wish to eat something while walking about. It is not the type of food generally ordered by a person who patronizes a hotel, restaurant or other public eating establishment with the intention of securing a ‘meal’. It may not be said that one has ‘served’ a meal who merely prepares a sandwich for consumption, wraps it in a paper napkin and hands it to a purchaser without offering any facilities for its consumption on the premises, and with the intention that it be consumed elsewhere. There is also a dispute between Denver, Colorado, Louisville, Kentucky, and Pasadena, California on who and where the cheeseburger was invented. Tennyson said he interviewed former restaurant employees who confirmed that the Rite Spot is where the cheeseburger debuted — although it was called the cheese hamburger. Lionel C. Sternberger is believed to have invented the “cheese hamburger” in the 1920s in the Northeast portion of Los Angeles County. Tales differ, however, as to precisely when this occurred, and where. Some peg the date as 1924, others as 1926. The site is usually said to be Pasadena, though that has been called into question. Charles Kaelin and his wife opened the restaurant in 1934, the menu claims, dubbing the old brick building at the corner of Newburg and Speed “The birthplace of the cheeseburger.” The standard hamburger had already become “an established staple of the diet” by then. But Kaelin was an inveterate experimenter, always looking for new food ideas. “One day in the kitchen … it occurred to him that if he put a slice of cheese on top of the hamburger patty just before it was done, the cheese would melt down into the patty and add a new tang to the hamburger. It was an instant success – it’s popularity spread nationwide until just about everyone the world over enjoys the cheeseburger. .
Today, a plaque (probably placed there by the owners) on the wall of the Kaelin Restaurant proudly state that Carl Kaelin invented the cheeseburger. The cheeseburger trademark was supposedly registered by Louis Ballast on March 5, 1935 of the Humpty Dumpty Barrel Drive-In in Denver, Colorado. Ballast claimed to have come up with the idea while testing hamburger toppings. Although Louis registered the name, he never made any claims, and the restaurant is now a thing of the past. Some historians dispute that he actually was issued a trademark. The American and His Food, Revised Edition, by Richard Osborn Cummings, published by University of Chicago Press, 1970. American Forum – Fast Food History, Handout #4: Mcfast-food Conques America. Birthplace of the Burger, The Lassen family has ’em the same way for generations at Louis’ Lunch, by Jim Shelton, Register Staff. The Better Burger Battle, Atlas of Popular Culture in the Northeatern United States, by John E. Harmon. Brief History of Athens, Texas, Texas Highways Magazine, July 1994. Boston Cooking School Cook Book, by Mrs. D.A. Lincoln, Dover Publications, Inc. Mineola, New York (1996 Reprint of the 1884 Classic). Bull Cook and authentic Historical Recipes and Practices, Volume II, by George Leonard Herter & Berthe E. Herter, 1967. Can you believe some dispute us? We won, now we celebrate – newspaper guide to hamburger cookoff, Athens (TX) Daily Review, Athens Daily Review, September 25, 1991. Cheap burger in paradise: History of the hamburger, by Milford Prewitt, North Carolina Discoveries. Food in American History, Part 6 – Beef (Part 1): Reconstruction and Growth Into the 20th Century (1865-1910), by Louis E. Grivetti, PhD, Jan L. Corlett, PhD, Bertram M. Gordon, PhD, and Cassius T. Lockett, PhD, Nutrition Today Magazine, Volume 39, January/February 2004, pp 16-25. From Boarding House to Bistro: the American Restaurant Then and Now, by Richard Pillsbury. Boston: Unwin Hyman, 1990. Hamburgers and Mustard: A Match Made in Wisconsin, by Eric Model, published by Hidden America – USA Today, July 23, 1999. History of the Menches Brothers. Louis’ Lunch (A little bit a history). Menches Bros. is more than just burgers, by Michelle Detwiler, 7/18/2002, Leader Publications, Akron, Ohio. 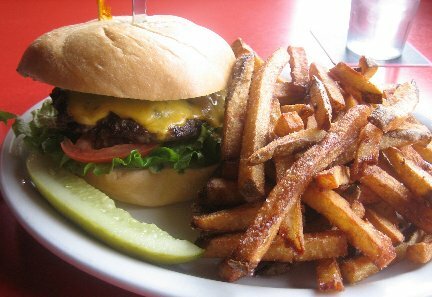 National Even Coming to Akron – Today is National Hamburger Day! City of Akron, 2004 News Release, May 28, 1994. The Night 2000 Men Came To Dinner, by Douglas G. Meldrum, published by Charles Scribner’s Sons, 1994. Old Menus Tell the History of Hamburgers in L.A., by Roger M. Grace, Thursday, January 15, 2004, Los Angeles, CA Metropolitan New-Enterprise. Online Extra: A Hamburger’s Tasty Legacy, March 14, 2005, BusinessWeek.com. Clarindan Is ‘Dan’ of Hamburgers, Omaha World-Herald, by Paige Carlin, date unknown. Paying Homage To The Hamburger Is A Patriotic Duty, by Doris Reynolds, Naples Daily News, May 26, 1999. State of Oklahoma, Executive Department, Proclamation, April 12, 1995. The Better Burger Battle, by John E. Harmon, Atlas of Popular Culture in the Northeastern United States. The Complete Hamburger – The History of America’s Favorite Sandwich, by Ronald L. McDonald, published by Carol Publishing Group, 1997. The Food of the Western World – An Encyclopedia of Food from North America and Europe, by Theodora Fitzgibbon, Quadrangle/The New York Times Book Co., 1976. The Food Chronology – The Food Chronology – A Food Lover’s Compendium of Events and Anecdotes, from Prehistory to the Present, by James Trager, New York, published by Henry Holt and Company, 1995. The Origin of Hamburgers and Ketchup, by Giovanni Ballarini, University of the Studies of Parma. The White Shoe Irregular: It was Fun while it lasted, Honoring Louis’ Lunch on Its 15th Anniversary, Representative Rosa L. DeLauro, Congressional Record, 27 July 2000, page E1377. They Only Serve Burgers Their Way, Making It In Connecticut, Your Money, March 12, 1994. Tolbert’s Texas, The Henderson County Hamburger, by F. X. Tolbert, Doubleday & Co., Garden City, New York, 1983. Weber’s Sperior Root Beer, by the Weber family. Welcome To Hamburger Heaven, by Michael Wallis, Oklahoma Today Magazine, May 1995.
Who Invented Hamburger Sandwich? And What About the Cheeseburger?, by Roger M. Grace, Reminiscing, Thursday, January 8, 2004, Metropolitan News-Enterprise. I had no idea that hamburgers had been around for such a long time! It was especially interesting to learn that the american hamburger claims its roots in Wisconsin. It was also cool to learn that the cheeseburger didn’t come about until much later than the hamburger too.